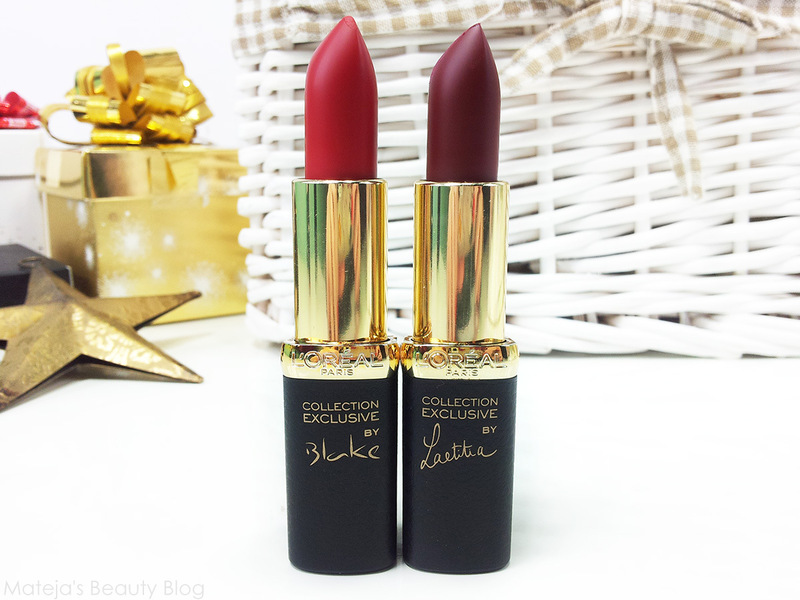 I've been raving about these two a lot so far, they've even been in my Best Buys in 2014 post, so here's a proper review to start off the new year. I wanted these so badly, swatched them every time I went to the shop, then the right people took the hint, gifted me both the shades that caught my eye and I couldn't be happier about it. These two lipsticks have been on my lips pretty much every day since I got them and Blake got the honour of being my New Year's Eve choice, while Laetitia is more of my everyday choice. 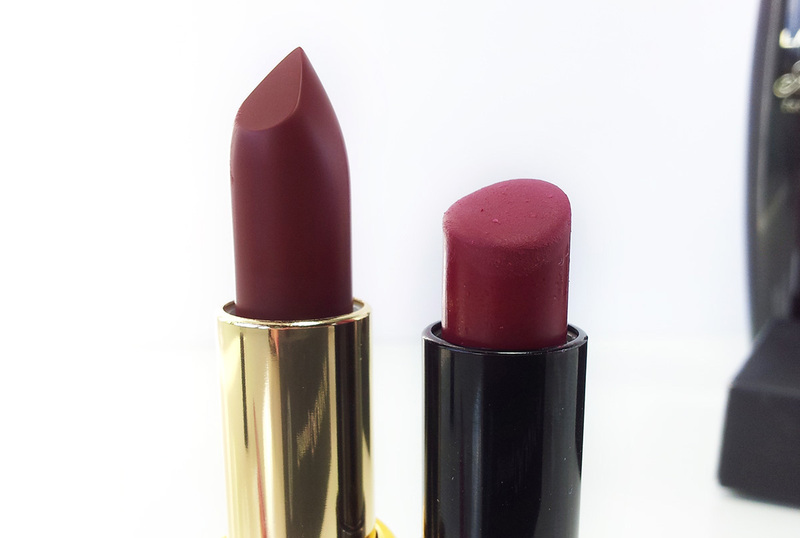 The texture of both of these is so smooth and they glide on the lips like a dream. 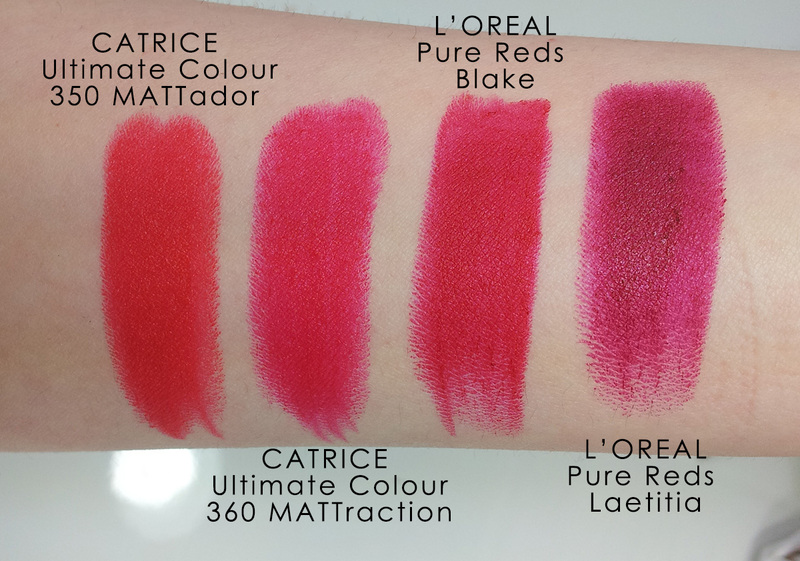 The pigmentation of both is fantastic and they need just one coat for a fully opaque, crisp colour, while the finish is matte, or creamy-matte just like at Catrice's MATTraction. My lips are almost never dry, so I don't want to mislead you into thinking that these aren't drying because I can't assess that properly, but I did notice that after several hours of wear, Laetita is a touch drying (nothing tragic, though), while Blake is ok. Staying power of both of these is fantastic. Obviously it helps that they are darker colours as well as that they are matte, but even so just swatching them on the hand left me with a stain that could not be removed just with soap. These last a long time on the lips, thought they do fade if you eat or drink, but don't completely disappear. The packaging of these is different than regular Colour Riche range as they have a sort of a leather design that makes them look a bit more expensive. 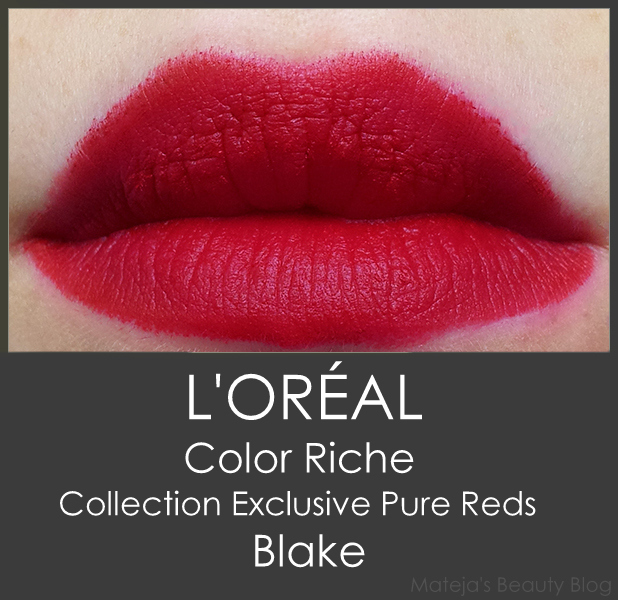 Blake is probably the most popular colour in this collection, also because unlike Laetitia it's available everywhere. It's a ruby cherry red with a blue undertone, so it's a very classic red, but I have nothing similar in my collection. 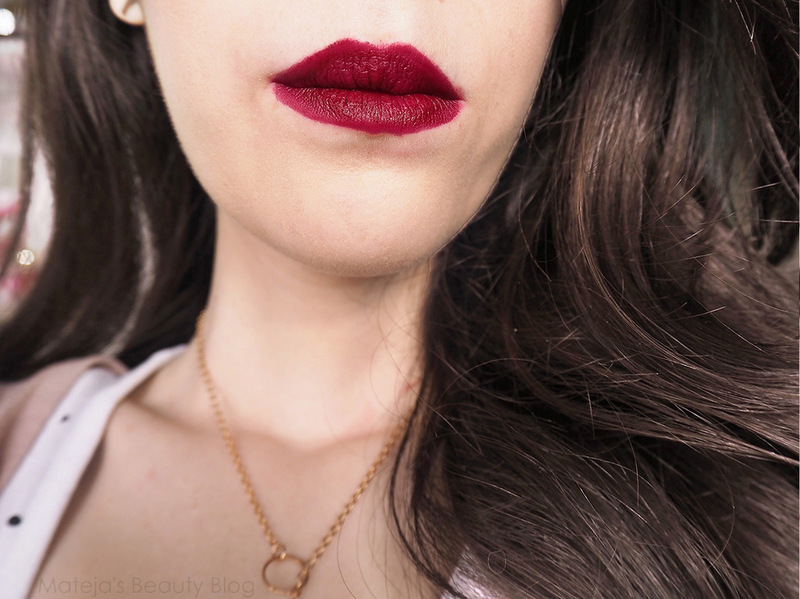 I think that the matte finish makes it even more striking and because the formula isn't drying as well as it's smoother, I prefer it to Ruby Woo, though the shade of the latter is brighter and not as blue toned (comparison at the end). Laetitia is the darkest shade in this collection and for some reason not sold everywhere (this may just be one of those impossible situations where Slovenes are the lucky ones). I'm a huge fan of Rimmel's Matte Lipstick in 107, but this is even better, especially regarding staying power. It's a proper deep red with some purple tones that are not as apparent as in 107 when on my lips. 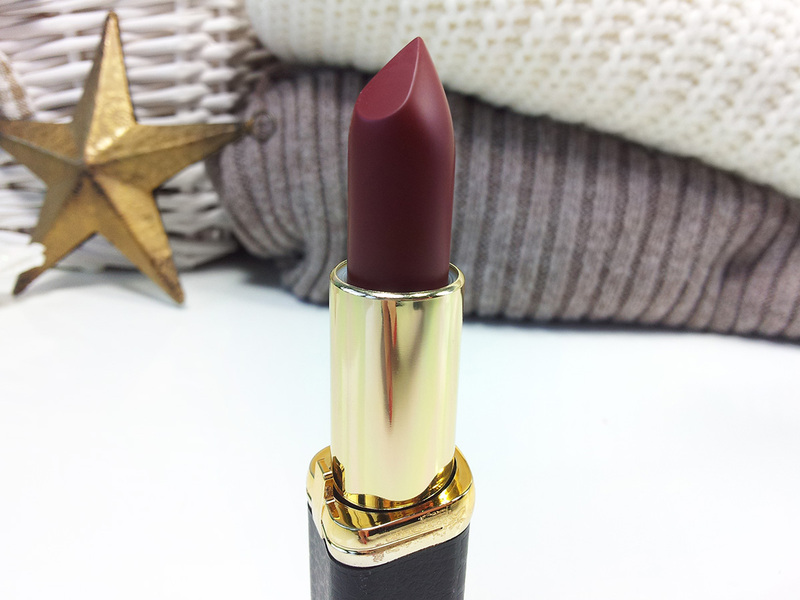 It's a striking shade and I have been wearing it on most days since I got it. It's strange how Laetitia looks so different in the bullet than on the lips. In the bullet is almost like an unappealing dark brownish red, but on the lips that purple tone shows up and it's a classic burgundy shade. 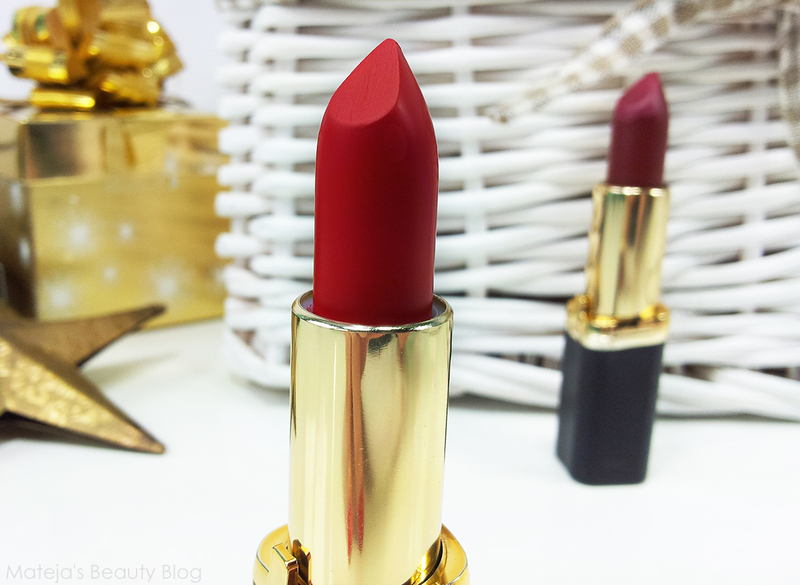 Pure Reds lipsticks cost 13-14 € depends on where you buy them, but so far I find that in Müller they are cheapest. I adore both of these, everything from the colour to the formula and staying power is amazing. 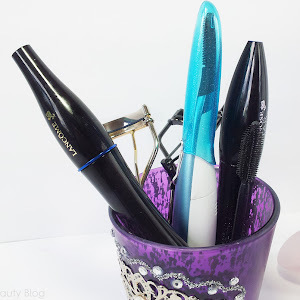 Their only fault is the high price, which is ridiculously high for drugstore, but I can't say that they are not worth it, since they are better than some MAC and high-end lipsticks in my opinion. 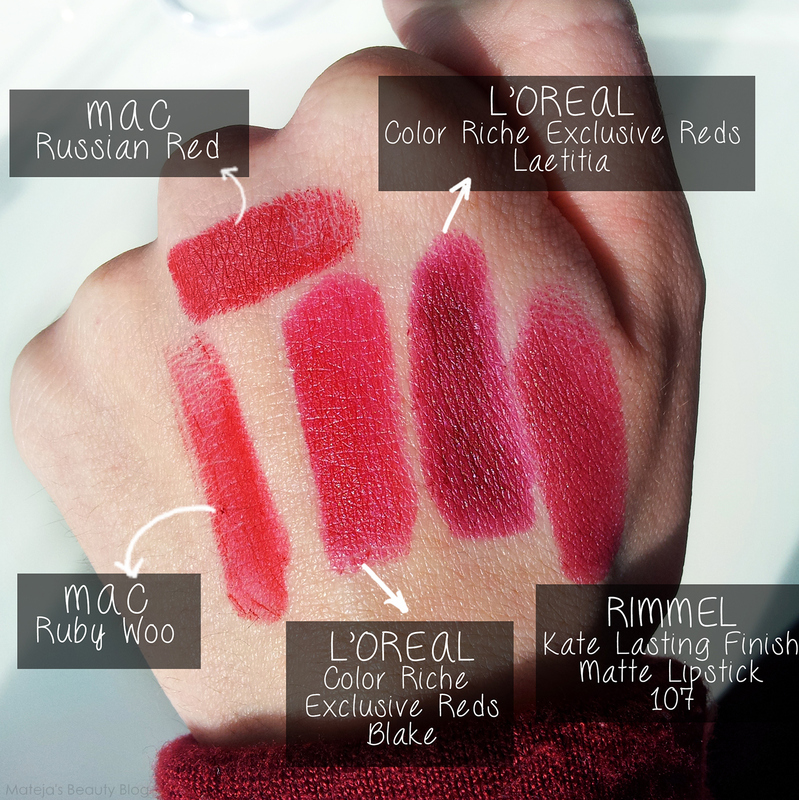 Do you have any favourites in the Pure Reds collection? Have a great day! 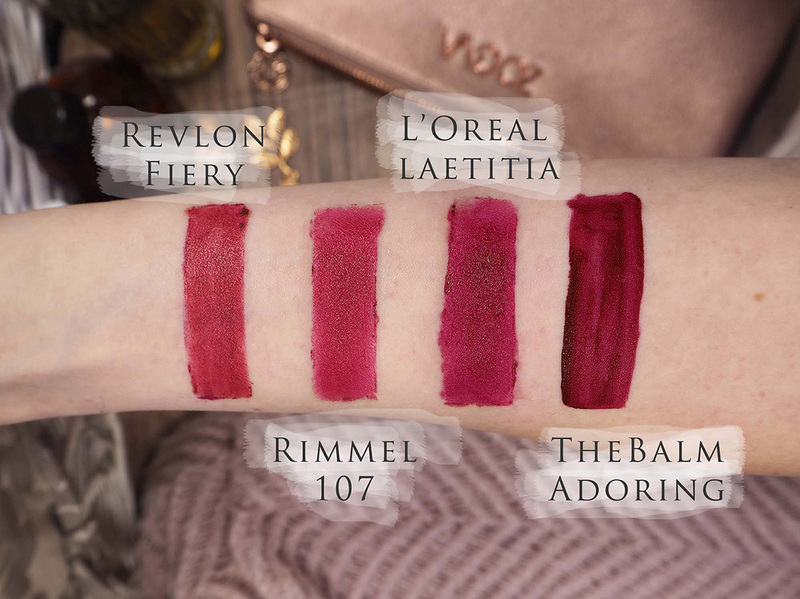 I want all of them but damn, they're expensive for drugstore lipsticks. Čudovita odtenka in oba ti res odlično pašeta. :) Blake mi je še posebej všeč. Me veseli, da se strinjaš, da je cena rahlo pretirana za L'Oreal, ker se mi je zdelo, da edina mislim tako:). Na fotografiji, kjer nosiš Laetitia imaš umetne trepalnice ali so to tvoje? Izgledajo fantastično:D.
Se mi je zdelo, da bo tebi Blake najbolj všeč :) Colour Riche je bila moja prva ever šminka že zelo, zelo dolgo nazaj (bili so še tolarji) in zagotovo takrat niso bile 13 €. Meni se zdi primerna cena za L'Orealove in npr. tudi Bourjoisove šminke nekje do 8 €, ampak na žalost grejo cene samo še gor. Blake is nice, but Leatitia? Ko jo swatcham na roki je tudi pri meni bolj opazen ta vijola podton, ampak zanimivo na ustnicah pa ne tako in ravno zato mi je ta odtenek izjemno všeč :) Boš videla pri eni izmed naslednjih objav Maybellinovo Berry Much, ki pa ima ta vijola podton bolj izražen, medtem ko na drugih sem že videla, da izgleda bolj bordo. I have a slight preference for Blake, but you wear both shades really well!